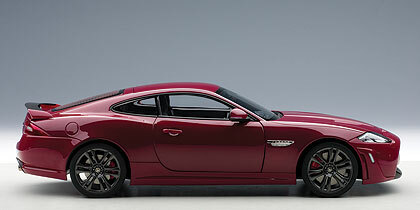 The Jag has Performance Active Exhaust, Adaptive Dynamics Suspension, a lower more aerodynamic ride height, forged aluminum suspension parts, and a rotary gear selector that pops up from the console. You can see that in Autoart’s version too. 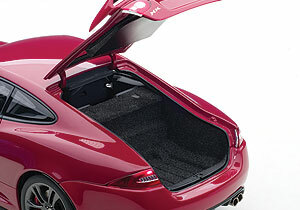 XKR-S also is loaded with high-performance brakes that feature 15-inch rotors up front and 14.8 inches in back, plus 4 tailpipes and a carbon fiber rear spoiler, all obvious on the Autoart model. Like the real deal this Autoart Jag features vertical slit air intakes on the sides of its nose while up front are realistic dual projector beam headlights and reflectors on the side fenders along with a chrome Jaguar logo on the front quarter panels, just behind the wheel wells. There’s also a black mesh grille with a circular Jaguar logo along with RS badging on the grille. I like the racy look of the carbon fiber nose spoiler and the nose has twin hood vents. This is a rear-opening hood with nicely detailed engine beneath and it features another Jaguar label, this one on the engine’s head cover. Not a lot to see, like the real car the engine is well sealed and hidden on the Autoart model. Like the real car, the engine compartment is packed full, but you can see cooling hoses, a few caps and such, and a lot of gray plastic. 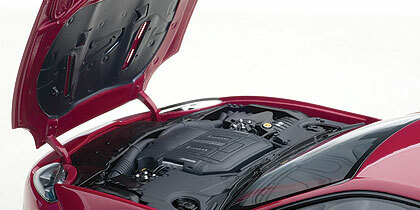 Engine bays are getting to look more generic in real cars, and that’s reflected here. 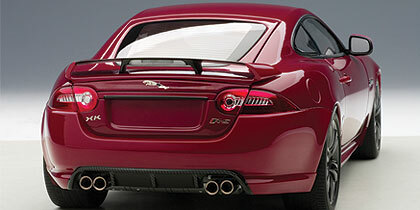 There’s also a carbon fiber rear wing and lower fascia in back with twin dual chrome exhausts and a leaping Jaguar logo on the trunk. The coupe’s cat-like red and white rear lights look realistic too and the hatch opens wide, its big rear window featuring an orange defroster grid. 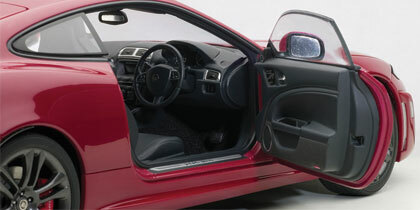 Autoart uses real mirrors on the doors, a nice reflection on its dedication to detail, plus well-detailed door handles and an XKR-S logo on the metal door sill, which you can see once either door is opened. Another finely detailed Autoart interior. The 1:18 XKR-S rolls on snazzy alloy one-piece Vulcan dark technical matte gray finish 6-spoke wheels that are perfectly shaped. 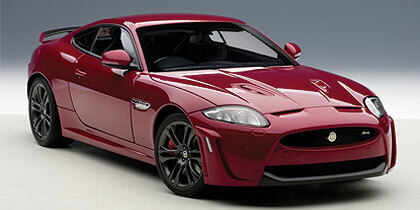 Behind those wheels are the giant rotors as on the full-size XKR-S with red Jaguar-labeled calipers. Tires are treaded and appear to be low-profiles, but are not branded. Inside, the model features a gray leather look interior with detailed dash and right-hand drive. Hey, the real ones ARE made in England. Adding realism are a glass-faced gauge pod, silver trimmed air vents, three-spoke steering wheel and console with that cool pop-up gear select knob mentioned earlier. I also like the chrome inside door releases and buttons on the doors that are designed to adjust the 1-to-1 car’s seats. Autoart also faithfully reproduces chrome-ringed stereo speakers and small subwoofers in the doors. This is another well executed Autoart model, and it’s a delightful luxury sports touring coupe that would look good in any collection. But it fits in especially well if you’re an Anglophile and collect British cars, such as Jags, Austin Healeys, Mini Coopers, Lotuses and McLarens.